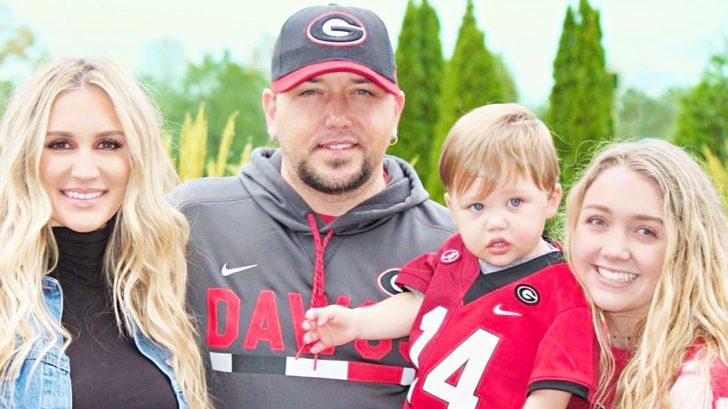 Jason Aldean‘s wife, Brittany, has been sharing sweet pictures of her pregnancy with all of us for a while now. Now, her newest post shows – and tells – us just how close the family is to welcoming the newest addition! A month later and the couple was back on social media, showing off one of the sweetest gender reveals we’ve ever seen. Jason and Brittany were joined by 8-month-old Memphis and Jason’s two daughters from his previous marriage – 11-year-old Kendyl and 15-year-old Keely. Keely guessed she’d be getting a little sister – and she was right! Jason and Brittany decided to give their baby girl a very unique name and revealed it during Brittany’s perfectly planned baby shower. For Jason, he wanted his kids to have names that their fellow classmates wouldn’t so that the teacher didn’t mix them all up or make them go by a middle name. With his experiences, we totally understand. That is why the couple decided to give their baby girl the name of “Navy Rome.” And while her name might be the color navy – there was plenty of pink at the baby shower! Not too long ago, Brittany shared a very fashionable photo of her in trendy workout clothes – baby bump and all! It was the first time she shared her due date or how far along she was with her fans and at 24 weeks, she looked flawless! Now, as it gets closer and closer to the due date, Brittany posted a family photo that shows just how similar all of the kids look to Jason. And she is right! All of Jason’s kids seem to take on his eyes and smile. And at 30 weeks, that means Brittany is only 10 weeks away from bringing in another Aldean to the world. Luckily, Navy will be coming into a very loving family. You can watch Brittany gush over Jason in the interview below and get excited folks – only a short time until the world gets to meet baby Navy!